If you want to explore the historical richness of the Mughal Empire, visiting two destinations namely Agra and Fatehpur Sikri is sufficient. Where Agra remained the prime focus of the rulers due to its influence on the Indian history, Fatehpur Sikri was the place chosen by Akbar as his new capital. Raj Travels India offers you an overnight Agra with Fatehpur Sikri tour in which you will explore the beauty of Majestic Taj Mahal and the unfortunate Fatehpur Sikri. Our representative will pick you from your hotel in Delhi or the airport. 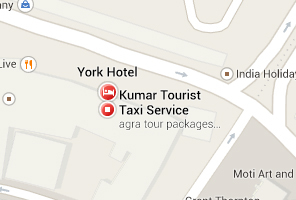 From here, start driving towards Agra on Yamuna Expressway. Enjoy the scenic beauty enroute and complete the journey in around 3 hours. Upon arrival, check into your hotel and rest for some time. Later, go out to explore the beauty of majestic Taj Mahal. The monument was built by Mughal Emperor Shah Jahan in memory of his wife Mumtaj Mahal who died while giving birth to their 14th child. The monument is made of pure marble and is counted amongst the Seven Wonders of the World. Due to being homage to the eternal love of the emperor for his wife, the monument is also referred to as the Symbol of Love. Agra Fort is a grand fort located close to Taj Mahal. It was constructed by Mughal Emperor Akbar to form his capital in Agra. Today, the fort is converted into a museum and it houses various belongings of the erstwhile rulers. Baby Taj, also known as the Tomb of Itmad-ud-Daula is a smaller replica of Taj Mahal and is an architectural masterpiece. After visiting these places, return to your hotel for a comfortable overnight stay. Early morning, check out from your hotel and drive towards Fatehpur Sikri, a historical town located 32km from Agra. It was Mughal Emperor Akbar who established this town to serve as his capital. Everything required to make a town prosperous was present here, until a severe draught hit the town. People left it and so did Akbar, who took his capital to Agra. Today, Fatehpur Sikri houses the ruins of those majestic monuments that the powerful emperor constructed. After visiting Fatehpur Sikri, return to Agra. Later, drive for Delhi where our representative will drop you at your hotel/airport/railway station as per your preference. The Overnight Agra with Fatehpur Sikri tour ends here.